Push the day/night lever forward for day driving. Pull it back to reduce glare of headlights from vehicles at the rear. 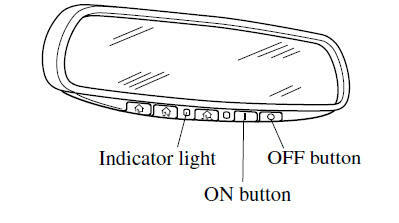 The auto-dimming mirror automatically reduces the glare of headlights from vehicles at the rear when the ignition is switched ON. function. The indicator light will turn off. To reactivate the auto-dimming function, press the ON button . The indicator light will illuminate. Do not use glass cleaner or suspend objects on or around the light sensor. 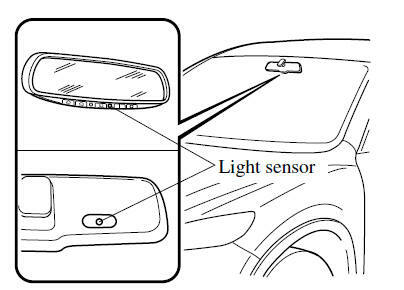 Otherwise, light sensor sensitivity will be affected and may not operate normally.
) 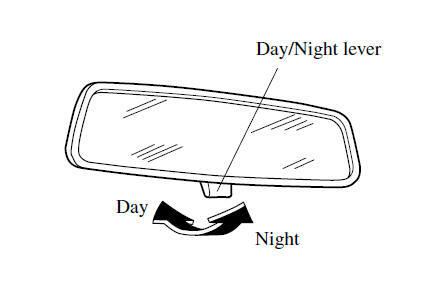 on the auto-dimming mirror. Refer to HomeLink Wireless Control System. The auto-dimming function is canceled when the ignition is switched ON and the shift/selector lever is in reverse (R).